who are (very soon!) due to have their little girl. and mat and layered it a few times, inking the edges in a soft pink each time. The paper was from my stash... no idea what pack it came from...sorry. The super cute hanging hearts are diecut from a memory box die. The new, swirly heart border strip ,ready-punched , was from a car boot sale, recently. 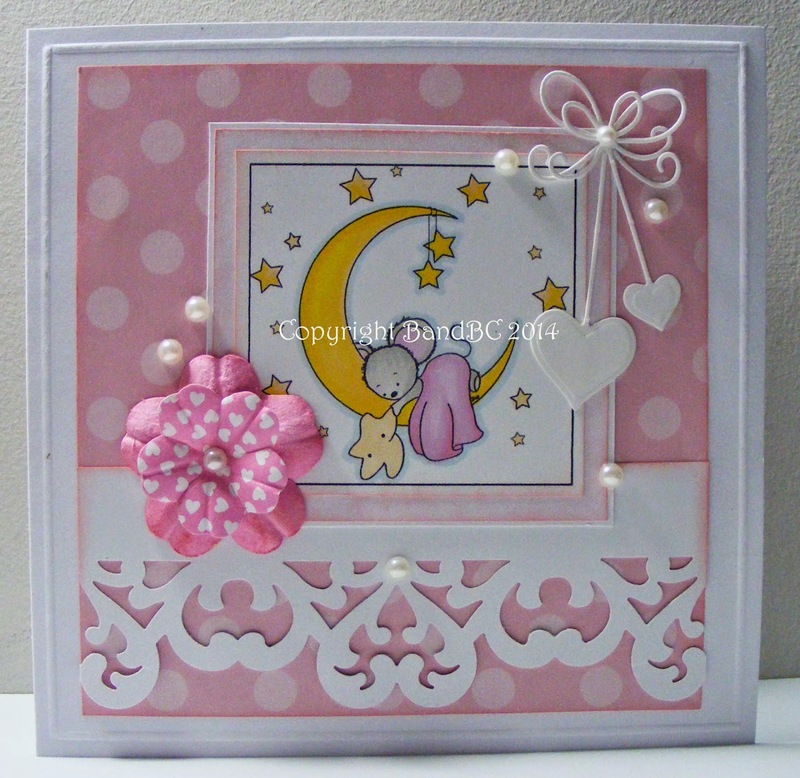 2 Dovecraft pink flowers and some pearls finished this sweet card. Thanks for joining our for a child challenge at Creative Card Crew. Beautiful baby card, love the diecuts. Totally delightful work Vic, thank you so much for sharing your creativity with us at Allsorts challenge. Thanks for sharing it with us at Little Claire. What a lovely card! The image is just so cute! Thank you for joining the Crafts Galore Encore Anything Goes January Challenge! Hope to see you again! Good luck! This is just so sweet! I'm sure your friends will love it :)Thank you for sharing it with us at Creative Card Crew this fortnight! Beautiful card!!! Love all the detail! Thanks for joining us at Party Time Tuesdays and good luck!!! !